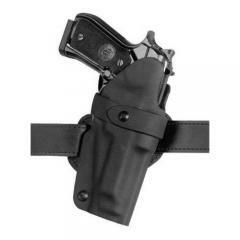 The Safariland 0701 concealment holster is molded with our exclusive Safari-laminatetm construction to match your particular gun and model. This ensures a snug fit. The durable, thermal-molded wraparound laminate is stronger and lighter than leather, and it won't rot, mildew or deform. The Safariland 0701 features a super-tough Kydex® outer layer which adds further protection and breakage resistance. Known around the world for their law enforcement products, Safariland is taking the knowledge gained to manufacturer holsters and accessories into the civilian market.